The Premiere: New acquisitions at Library and Archives Canada exhibition presents an unpublished work by Normand Chaurette entitled Œuvres complètes. Tome I. This work was chosen by our specialist Michel Guénette, a performing arts archivist. First, a profile of the author, to understand his creative context: Normand Chaurette is a Quebec playwright who was born in Montréal in 1954. Along with Michel Marc Bouchard and René-Daniel Dubois, he is in the generation of post‑referendum writers who turned away from the nationalist and realist theatre of the 1960s and 1970s, and instead created dramatic works that focused on artistic and linguistic renewal. Chaurette’s play Provincetown Playhouse, juillet 1919, j’avais 19 ans (1982) was a huge success and established his name. His theatrical career includes La société de Métis (1983), Fragments d’une lettre d’adieu lus par des géologues (1986), Les Reines (1991), Le Passage de l’Indiana (1996), Le Petit Köchel (2000) and Ce qui meurt en dernier (2008). His plays have been performed abroad as well, including the Comédie-Française’s 1997 production of Les Reines. He is also well known for the widely popular play Edgar et ses fantômes (2010), and its 2018 adaptation in France, Patrick et ses fantômes. In addition to plays, Chaurette has also written a book, short stories, film scripts, translations, radio scripts and an essay. His work, which transformed the theatrical and literary landscapes, has earned much respect across the Canadian and international artistic world. Chaurette has received numerous awards, including four Governor General’s Literary Awards, four “Masques” from the Académie québécoise du théâtre, and a Floyd S. Chalmers Award. He also received a writing bursary from the Association Beaumarchais in Paris. Chaurette was appointed to the Order of Canada in the fall of 2004. The Normand Chaurette fonds acquired by Library and Archives Canada includes documents about his career and personal life. The majority of the documents are annotated manuscripts and typescripts, outlines, drafts, notes and final versions of his writings. They include the original of Œuvres complètes. Tome I, which is in perfect condition. 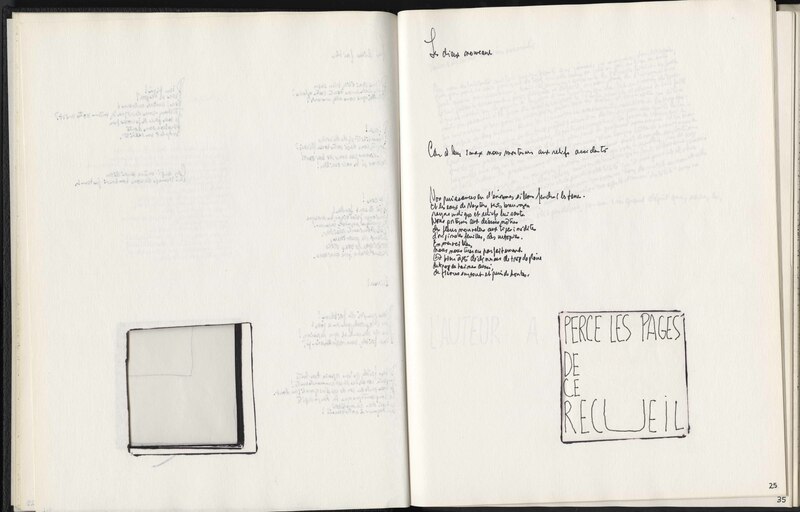 The work is a kind of artist’s book, an illustrated book containing handwritten texts, drawings, watercolours and cut-out images. This magnificent book is divided into sections, including “Les dieux faibles,” “Orgues,” “Lettres au superbe,” “Texte de Londres,” “Nouveaux textes de Londres” and more. Chaurette began writing this early work in 1970 at the age of 16 and completed it in 1975; he later added some more pages in 1977 and 1978. We might assume that Chaurette had literary ambitions at this time; the book is both strange and fascinating, with enigmatic and repetitive sentences. Readers might even see the influence of automatists like Claude Gauvreau and surrealists like Guillaume Apollinaire. But such assumptions would be erroneous. Chaurette had no artistic ambitions as an adolescent. In an email dated April 19, 2018, he explains that he had dropped out of school and did not dream of becoming a writer, at least not until 1976, when he won an award for a radio script, Rêve d’une nuit d’hôpital, that was broadcast on Radio-Canada. So why did he fill page after page of a book with tiny words when he had no expectation of publishing it? Chaurette was going through a difficult time in his life: he had dropped out of school, was questioning his future and wanted to be out on his own. With the help of certain substances, he searched for his identity and retreated into his own world. As he explained in a telephone conversation, this was the time of the October Crisis, strikes, demonstrations and schools being closed down; it was a dark and very uncertain time for him. He could not talk to his parents about his fears or share some things in his life, so he took refuge in writing, drawing and painting, where he expressed all of his uncertainties and fears. He spent sleepless nights sketching and writing in books that served as his diaries. Readers are given access to the writer’s private thoughts. We also learn that the titles in this work are meaningful. For example, Chaurette had family in London, England, and he went to the city to learn English. So it is not surprising that some of his writing was done there. Chaurette envisioned a second volume, but the heavy demands of the first one led him to abandon this idea. With the passage of time, he moved on to other projects. 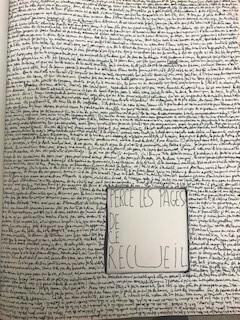 Chaurette wrote his texts in code, in tiny, almost illegible letters, worried that his journals would be discovered. He destroyed most of them as he went along so his parents would not find his compositions. Only the book Œuvres complètes. Tome I survives. 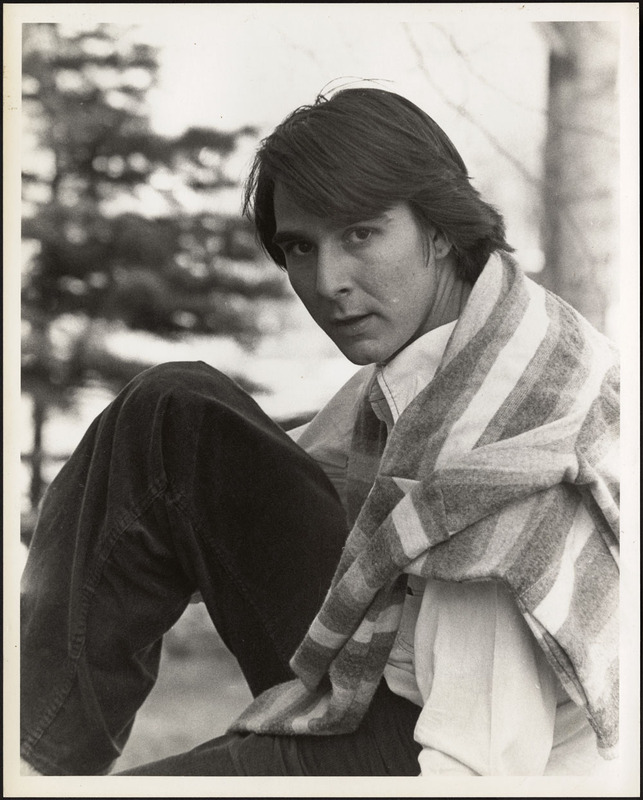 Chaurette is pleased that Library and Archives Canada will preserve and make accessible to researchers the confidences of a troubled youth who became a major author. We can already see in this work the talents of a young writer who would develop over time. Michel Guénette is a performing arts archivist in the Social Life and Culture Private Archives Division of the Archives Branch at Library and Archives Canada. This entry was posted in Exhibitions and tagged playwrights, theatre, writers by Library and Archives Canada Blog. Bookmark the permalink.